On September 1, 1939 Nazi troops marched into Poland. Two days later Great Britain and France declared war on Germany. In the following months Germany’s blitzkrieg swept across the Netherlands, Belgium and France. America became keenly aware of the threat to democracy in Europe but, except for providing supplies to our allies, maintained a neutral posture. As America began to build its war material production capabilities, Jimmy Doolittle was asked if he would return to active duty to oversee aircraft engine production at the Allison plant in Indianapolis, Indiana as a representative of the Army Air Corps. Doolittle accepted the request and received an indefinite leave of absence from Shell at the end of June 1940. Japan attacked Pearl Harbor, Hawaii on December 7, 1941 and President Roosevelt declared war on Japan the following day. America became fully immersed in WWII five days later when Germany, an Axis partner of Japan, declared war on the United States. America was shocked and depressed by the loss of personnel and Naval assets in the surprise attack. Jimmy Doolittle would soon learn how our military would respond. General Hap Arnold, Chief of Staff of Army Air Forces, called Doolittle into his office and asked him “what airplane do we have that can take off in 500 feet, carry a 2,000-pound bomb, and fly 2,000 miles with a full crew?” Also, “the plane must be able to take off in a narrow space not over 75 feet wide.” After taking some time to study the problem, Doolittle concluded that there is only one plane that can do it – the North American B-25 medium bomber. Doolittle later discovered that General Arnold, under orders from President Roosevelt, was seeking a means of striking back at the Japanese home islands at the earliest possible moment. 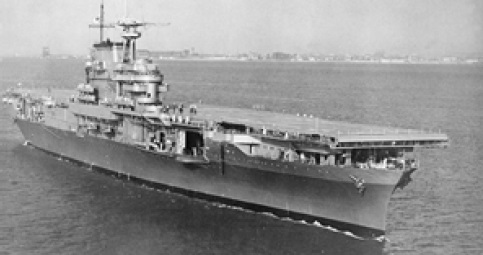 In a plan conceived by Navy Captain Frances Low (a submariner), a Navy aircraft carrier would launch the bombers within striking distance of Japan. Low presented his scheme to Admiral Ernest King, Chief of Naval Operations who enthusiastically shared the plan with a receptive General Arnold. carrier and provide Navy personnel to assist in training the Army pilots in carrier take off techniques. The Army would assign a task leader who would select an appropriate aircraft, determine and perform necessary modifications, select and train crews, and maintain Top Secret security. Lieutenant Colonel Jimmy Doolittle was charged with preparing all aspects of the Army’s part in the planned raid on Japan. (Doolittle was promoted to Lieutenant Colonel on January 2, 1942, just days after the attack on Pearl Harbor.) 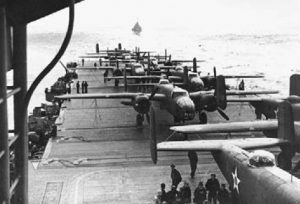 Doolittle requested 24 B-25 aircraft with the hope that 18 would be in top shape for the mission. One of the first major modifications to the aircraft was the installation of additional fuel tanks and rubber fuel bladders to extend the range of the B-25s. The auxiliary tanks increased the capacity to over two and one-half times the normal fuel load. Since it would not be possible for the aircraft to return and land on the carrier, the plan called for the bombers to fly on to China where the aircraft would be turned over to friendly forces fighting the Japanese. Other modifications included removing the lower remote control gun turret to save weight, installing new bomb shackles, removing the guns in the tail and installing two broomsticks to simulate the removed guns, and discarding the Norden bombsite which was replaced with a simple sighting device. At that time Mitscher was not told the reason for the tests. On the afternoon of February 1, with the Hornet sailing out of sight of land, two lightly loaded B-25s took off and safely and returned to the base at Norfolk. off training commenced at Elgin Field, Florida. 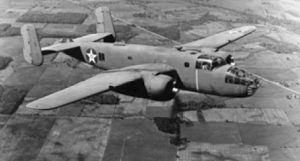 Before long the modified B-25s were able to take off within 350 feet in a 40-knot wind at a gross weight of 31,000 pounds – 2,000 pounds above the aircraft’s designed maximum load. Doolittle joined the other pilots in the take off training in hope of qualifying as a pilot on the raid – his task at the time was only to prepare for the mission and he suspected his superiors were not considering him to actually participate in the event. he might help plan. Doolittle persisted, got Arnold’s Chief of Staff to approve and Arnold relented. At the end of March 1942, twenty-two modified B-25s (two were damaged in take off training) were flown to the Sacramento Air Depot, McClellan Army Air Field. Final take off practice was conducted at Glenn County Airport, Willows, California. When preparations were complete, the aircraft were flown to the Naval Air Station at Alameda, California where the U.S.S. Hornet was docked. Sixteen B-25 Mitchell bombers were loaded on the deck of the Hornet and it sailed under the Golden Gate Bridge on April 2, 1942. 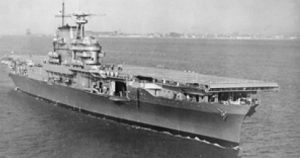 With its deck covered with B-25s and its fighter and scout aircraft stowed in the hangar deck, the Hornet could not provide an air defense for itself and the other ships of Task Force 18. North of the Hawaiian Islands the USS Enterprise and its Task Force (16) under the command of Admiral William “Bull” Halsey joined up with Task Force 18 for protection in the event they encountered a Japanese air attack.